Since my mother is Jewish, but certainly not Kosher, I grew up eating several “traditional” Jewish foods. One of my favorites is latkes. Another is macaroons. With Passover approaching, I’m reminded of the Manischewitz chocolate, vanilla, and chocolate chip (my favorite!) macaroons that Mom would buy every year. We would devour them since they were a seasonal treat, and I looked forward to Passover every year so we could have more. Now, as I continue down my real food journey, I just can’t buy those same macaroons. They are ultra-processed, filled with all kinds of undesirable ingredients (four different types of sugar/sweetener, sulfites, artificial flavor), and they just don’t taste that good anymore. Good thing there are some great alternatives out there! $7.69 for 8 macaroons is no bargain, but they sure are tasty! I happened upon Coco-Roons one day in a natural foods store and bought a package even though they were quite expensive. And they were delicious! So delicious in fact that I didn’t want to share them with my kids…but I did anyway…and they were a hit. We’ve tried several of the flavors, but the Cacao Nib is my favorite, and after spending so much money on such small packages of these treats, I decided to try to make them myself. Through many batches and numerous, but still tasty, failures, I think I’ve replicated them to the best of my non-baker ability. 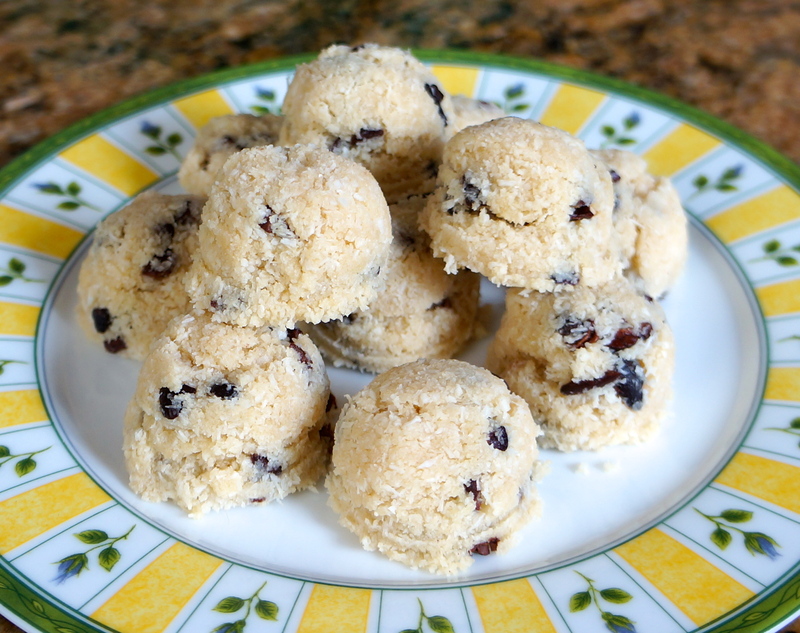 So here is a grain-free, egg-free, yummy treat just in time for Passover (or anytime!). I hope you enjoy them as much as we do. 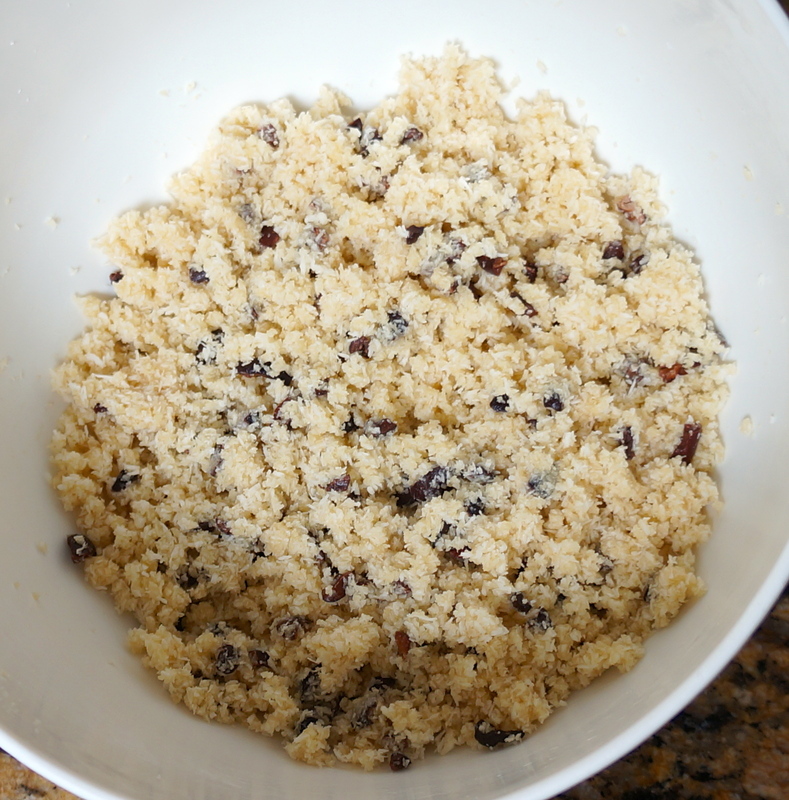 In a medium size bowl, mix together the dry ingredients (coconut powder, almond flour, cacao nibs, and sea salt). In a small bowl, mix together the wet ingredients (coconut oil, maple syrup, and vanilla). Mix the wet ingredients into the dry until thoroughly combined. The mixture will be a little crumbly, but should hold together when pinched or pressed. 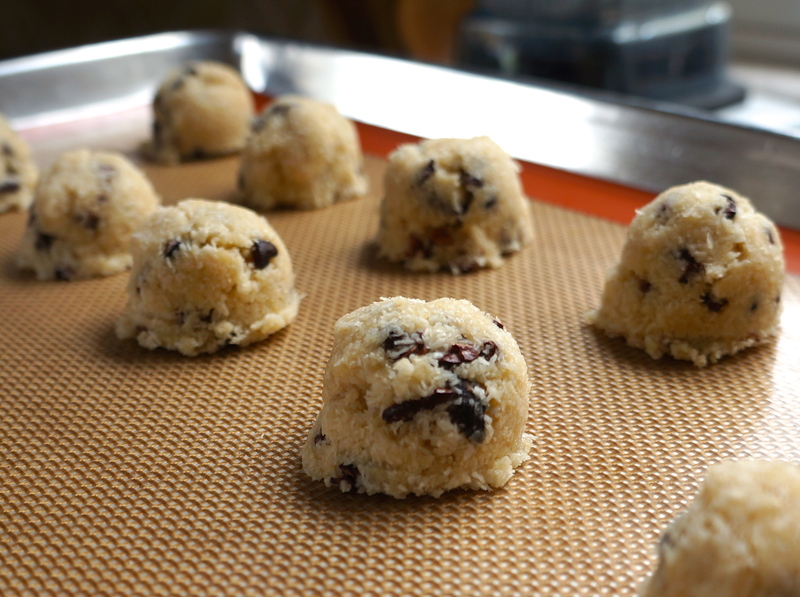 Using a small cookie scoop (or a measuring tablespoon), pack the mixture as tight as possible and then turn out onto a silicone baking mat or parchment paper-lined baking sheet. If the faux-co-roons fall apart, use your hands to pack them together tightly or use the scoop to pack them again. The tighter you pack them, the less crumbly they will be once they are cooked. If you find that you just can’t keep them together, add a bit more coconut oil, but if you add too much they will be overly moist. Put the faux-co-roons in the oven for 5 minutes, then turn off the oven but leave them inside for 10 more minutes. Remove from the oven and let them cool completely. Eat them immediately or put them in an airtight container overnight. They are tasty straight from the oven, but the texture improves and is more “Coco-roon-like” if they have time to rest. Enjoy! *Note: The Coco-Roon brand of macaroons is raw, and if you have a dehydrator you could probably make my version and keep them raw as well. My faux-co-roons are not cooked very long in high heat, but since I didn’t measure the internal temperature, I can’t say for sure that they are raw. You could always eat the mixture before cooking it, though! 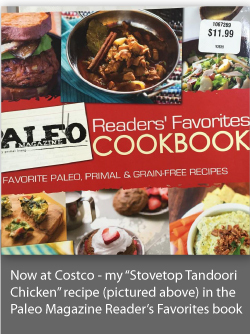 This post is linked to Tasty Traditions, The Paleo Rodeo and Fight Back Friday. Good question! Coconut flour is a completely different product from shredded coconut and really needs some eggs to bind it together; it also needs to be cooked. If you get finely shredded coconut, you shouldn’t have the texture issues. And if you can’t find finely shredded coconut, put some of the larger flakes/shredded pieces in a food processor and pulse until it has a fine texture. By the way, I searched for this recipe after buying coco-roons at my healthfood store. Love them…but they were $7.69 for a little bag!!! CRAZY!! Just put these in the oven. Thanks for taking the time to dissect the recipe and figure out a way to make these at home. I found they were very crumbly and very difficult to form into balls. I added a little extra coconut oil, which didn’t help much. I think next time I would add a little shortening or something. Also this recipe makes about half as much as one of those bags, so double it up if you’re expecting to get about the same amount. Yes, the “dough” is very crumbly. That’s why I pack it tightly into a small cookie scoop. You really have to press it in and pack it super tightly for it to hold together until they bake. Also, when I make them (each one is about a measuring tablespoon in volume), I get 10-12 (and the bags have 8). If you make them larger, then you will not get as many. I hope they turn out for you in the future! thank you so much for posting this! I’m allergic to almonds… Are there any other gluten free flours that would work with this recipe? If you tolerate other nuts/seeds, I would probably try cashew flour next and then maybe sunflower seed flour after that. 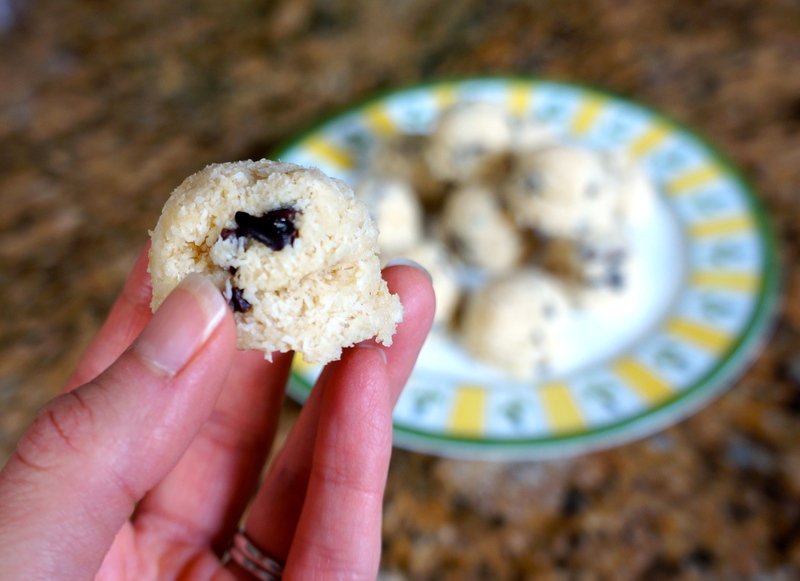 I haven’t tried this recipe with anything except almond flour, so I’m not sure about the taste. If you try it with another flour, let me know how it turns out! I would love to try these, but my daughter and I do not care for cacao nibs. Have you, by chance, figured out how to make the lemon pie and/or brownie flavored Coco-Roons? Thanks! Hi Janet! I did fool around with a brownie version–I’ll have to revisit it and see about posting it soon. Thanks for the inspiration ;).